Listing all of the ongoing issues and disputes within HMRC at present would be an essay in itself. Suffice to say, there are a lot. In this post I want to talk about two in particular; the imposition of detrimental new terms and conditions for staff and the quotas in the new performance management system which are aimed at making it easier to sack the “bottom 10%” of staff from the job. Both of these issues are ones faced by workers across the civil service. However, each government department is dealing with them slightly differently, so what follows will be about the disputes as specific to HMRC. Imposed changes to civil service terms and conditions first became an issue following the leak of Cabinet Office documents in October last year. This led to wildcat walkouts by HMRC workers in Coventry and the subsequent formation of the Civil Service Rank & File Network. However, whilst this subsequently spurred PCS nationally to revive its national campaign, the response of the Revenue & Customs Group Executive Committee (GEC) remained questionable. In November, they received the first version of the proposed changes and opted to keep these confidential from the membership. Despite this, they were leaked and it became apparent that there was enough anger from workers over the issue that HMRC opted to withdraw them. Much further down the line, a second set of proposals was received. Having learned their lesson, the GEC made these public when announcing that they had formally rejected them. However, despite this rejection and the inclusion of demands around the issue in national strike action the changes were imposed. They had been watered down in several areas and for the most part now only applied to those on promotion and new starters. Which makes you wonder what more could have been won had the original version been publicised and action built around it. At PCS R&C Group Conference this year, delegates passed a policy instructing the GEC to ballot over the changes and take action. The GEC opposed this course, arguing that there was no need as it was covered by the broader national mandate. The counter argument was that a specific mandate in HMRC would prevent action being stalled by the national union, which turned out to be a prescient point as National Conference voted to stall the campaign over the summer in the name of consultation1. Following on from this decision, the GEC have thus far not started a ballot process or issued any bulletins in reference to it. The imposed conditions remain in place for workers and enough time has lapsed that anger has congealed into apathy. This year, individual departmental job appraisal systems were replaced with a civil service wide performance management system. A lot of it was the same as had been in place previously, however one key difference was the use of “guided distribution” to outline how many staff were expected to be marked as “must improve.” This figure – 10% - lined up with previous government pronouncements on wanting to sack the bottom 10% of staff and put staff at risk of being put on performance procedures which could see them pushed out the door. The initial response to this policy was cooperation under protest. PCS members were advised to hand in a letter objecting to the system, then take part in it to the fullest extent, relying on grievances and casework if they were likely to receive a detrimental marking. At Conference, it was pointed out that this was simply allowing the new system to bed in and a proper collective response of non-cooperation was demanded. Again, the GEC were on the losing side of the argument, insisting that taking part would cause more disruption and that non-cooperation only put members at risk of being disciplined for refusing reasonable management instruction. Having lost that fight, the GEC delayed doing anything for almost four months. In that time, the only bulletin on the subject stated that discussions were still ongoing on how to implement the new policy, and in the meantime the old one still applied2. Eventually, as staff were starting to face their mid year reviews and have indicative performance markings imposed, the GEC announced that non-cooperation would begin and further advice would follow. That advice never came. Within a matter of days, the policy had changed from non-cooperation to simply deferring meetings whilst talks continued. This left a lot of reps and workers at a loose end, unsure what exactly to do, and apparently even went against the vote taken by the GEC itself. Threats from management of disciplinary action for not cooperating were issued and the general feeling of PCS members was that the union had betrayed them. It eventually came out that PCS announcing non-cooperation had brought the employer back to the negotiating table and a deferment had been officially agreed to allow talks to reach a conclusion. However, the fact that detailed advice on non-cooperation never materialised from PCS and that it took a succession of bulletins before the reasoning was revealed (whilst workers were being threatened with disciplinary action) only helped undermine the union position. At the time of writing we are awaiting the decision of the GEC on management’s new position. However, given how quickly PCS pulled its punches, any concessions on offer are likely to be minor at best. It would seem at this point that after delaying non-cooperation as long as possible those on the GEC responsible for this issue then sought to bring it to an end as quickly as possible. The Association of Revenue & Customs (ARC) is the HMRC section of a union called FDA. 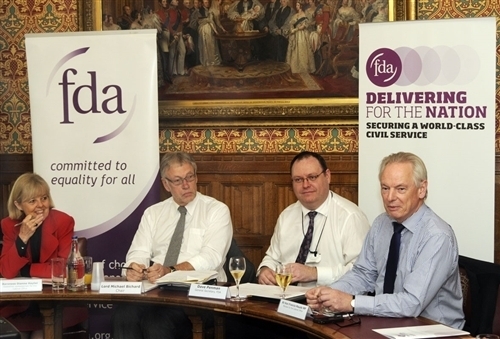 While PCS represents clerical staff and front line managers within the civil service, FDA and ARC represent senior management grades. The only industrial action they have taken to date was on 30 November 2011 over public sector pensions. However, whilst ARC as a union of bosses are fundamentally more conservative in their makeup than PCS, on these two issues they have actually managed to outflank the ‘left-led’ union to the left without even trying3. Half way through the year, the ARC Committee made preparations to ballot for industrial action short of strike over performance management and terms and conditions. This led to HMRC issuing an “improved offer” to the union4. Though the concessions given were relatively marginal5, they were enough for the Committee to recommend that their members accept them6. ARC are not a radical union, even within the parameters of mainstream trade unionism. It doesn’t have an even nominally left wing leadership nor a rank-and-file chomping at the bit to fight the government. Yet they have pushed these two issues further than a union often said to be at the forefront of fighting austerity, and there is the possibility that soon the bosses’ union could be balloting for action over issues where the clerical union in the same workplace has already cut a deal. Slight though the chance of it is, that this scenario has come up at all presents a possible embarrassment for PCS. It also underlines why the rank-and-file in the lower grades need to dig their heels in and get organising. Since this post was written, ARC have confirmed that they are balloting their members for strike action over performance management and terms and conditions8. PCS have suspended their non-cooperation with performance management and a ballot on terms and conditions remains yet to materialise. 1. The rights and wrongs of this are a separate issue, but suffice to say that the result was an almost four month break in action, which at the time of writing has yet to resume. 8. 131018: Update No 45 2013. At the time of writing, downloadable at the same link as the previous footnote.